The buzz begins with one word: Rafa. A swell of people circles an outer court at Indian Wells Tennis Garden. Several fans snake to the front of the crowd in time to see Rafael Nadal unleash a punishing forehand during a practice session. His biceps ripple as he whips his racquet across the back of the ball, sending it spinning forward like a fuzzy, yellow bullet that shoots across the net and then — seemingly against all laws of physics — drops just inside the line. One fan commented that Nadal reminded her of a big puppy, loping onto the court like a retriever, his tangle of dark hair spilling over a bandana and his stride electrified with boundless energy. When he cut his long hair, women blogged and tweeted about how they missed that defining feature. But for Nadal, it was a figurative shrug of the tresses. “You grow and you change. Facts of life,” he says. He continued training through the heartache, keeping his routines intact, and waited for the competitive fire to return. It did. He won seven major titles in 2010, including three Grand Slams: U.S. Open, Wimbledon, and French Open. He’s been called ferocious, tenacious, intense, and focused. Watching Nadal focus on the ball during play is an exercise in Zen. He personifies “be here now” the second he steps on the court. He zeroes in on his team’s box and may offer a quick nod to fans; but after that he’s in the zone, seemingly oblivious to the commotion around him. In the locker room, Nadal prepares for competition with determined precision. He methodically wraps overgrips on each handle of his six racquets. Before warming up, he checks his bag for items he may need: extra socks and shirts, a pair of casual shoes, and his ever-present iPod. Music is a critical component of Nadal’s pregame routine. It helps distance him from chaotic surroundings. “Before a match, I always have my headset on,” he says. His on-court rituals are equally precise. Before each point, Nadal tucks his damp hair behind his ears and tugs at the back of his shorts. During changeovers, he takes a sip from a water bottle and carefully sets it back in the same place. Then he sips from a second water bottle, returning it also to its dedicated position. He does these things with unwavering consistency. His biggest threats at this year’s BNP Paribas Open (March 5-18) are No. 1 player Novak Djokovic and longtime rival (and friend) Roger Federer, now trailing him at No. 3 in the ATP rankings. “But I always say that the most challenging opponent is the next one you play against, in any round,” Nadal says. He briefly considered golf as an alternative to tennis after a potentially career-ending injury sidelined him in 2005 (he’s that good on the green). He golfs when he can while competing in the BNP Paribas Open. He was a guest of golf pro Fred Couples at the Madison Club in La Quinta. And this year, he looks forward to joining tournament owner and business mogul Larry Ellison for a round or two at Porcupine Creek. “They are two of the most amazing golf courses in the world,” Nadal says. Whether playing golf or tennis, athletes need to eat. 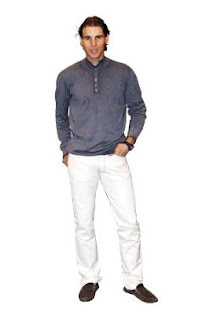 For a few weeks in March, you might find Nadal dining at Okura Robata Grill and Sushi Bar, Ristorante Mamma Gina, Pacifica Seafood Restaurant, or LG’s Prime Steakhouse. He also enjoys staying in his villa and grilling meat or fish he buys at a local supermarket. 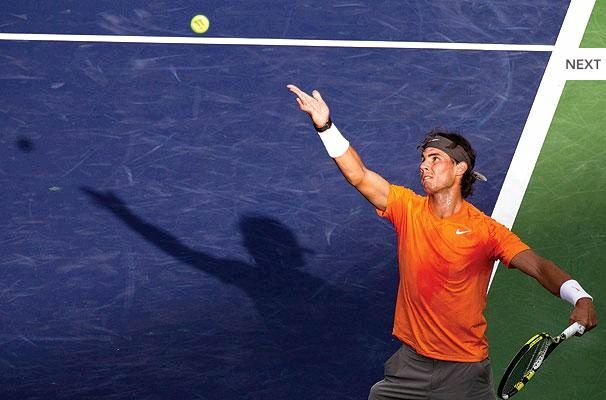 BNP Paribas Open (March 5-18) serves up more than 300 professional tennis players from around the world and draws hundreds of thousands of spectators to Indian Wells Tennis Garden. The tournament is one of few major events that combine ATP World Tour and WTA men and women (with $9 million in total prize money in 2011). Defending champions Caroline Wozniacki and Novak Djokovic will compete against top players, including Kim Clijsters, Lindsay Davenport, Roger Federer, Ana Ivanovic, Rafael Nadal, Andy Roddick, and Maria Sharapova. For tickets, special promotions and a rundown of entertainment, and attendant events in the tennis village, visit www.bnpparibasopen.com. The tennis star launched the Rafa Nadal Foundation in 2008 to support and provide opportunities for disadvantaged youth. The foundation’s mission is to “provide an opportunity for children and adolescents with disabilities, those coming from underprivileged surroundings, and those limited by an unfortunate family environment.” The foundation offers educational programs in which sports are a vehicle for personal and social integration, passing on values such as effort, self-improvement, and respect in order to encourage their self-esteem and confidence. Visit www.rafaelnadal.com.